The TBS Just for Laughs Festival: "The Lil Rel Show"
The TBS Just for Laughs Festival is officially over; however, through six shows over four days, Jokes and Notes, 4641 S. King Dr., featured staples of Chicago's urban comedy scene including Damon Williams, Vanessa Fraction, Marlon Mitchell and others; rounding out the festival's run at the popular South Side comedy club was comedian Milton "Lil' Rel" Howery, who hosted "The Lil Rel Show," an alternative mix of his stand-up along with special guests, Taneshia Rice, Russ Williamson, Buck Wild and Marc Henderson. The West Side native and Jokes and Notes favorite is fresh off the success of his stand-up special, "The Half Hour: Lil Rel," which premiered earlier this month on Comedy Central--but on Father's Day, he kept the crowd in stitches with hilarious tales about aggressive church pastors, finding the "funny" in funerals (including thugs who roast the deceased), why Chicago is still his favorite city, and more. While Lil Rel definitely worked the room, there was another star that stole the show: the blue, tight-fitting, leopard-print shirt the comedian wore. He was downright hilarious in his night-long, self-deprecating bit about the shirt, even closing out the night with an improvisational Lil Wayne and Gucci Mane-styled rap song (accompanied by Comedian Roy) about it. 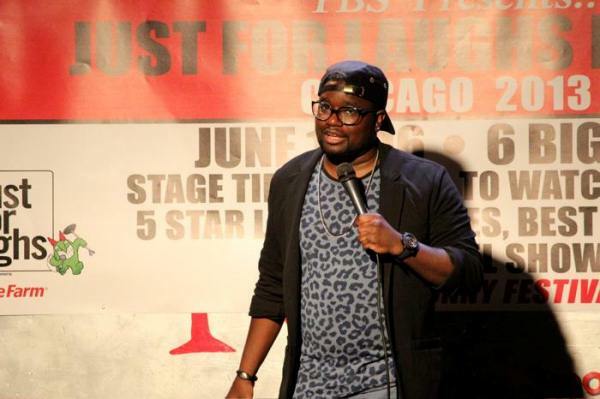 Lil Rel, who is definitely having a great year with touring, comedy specials, and an upcoming web series, knows his audiences, gives them what they want, and does it--just for laughs. Lil Rel photo & video courtesy of Comedy of Chicago.